If you are looking for a bag that stands out from the crowd, but at the same time it is made to offer all the practicality you can handle, then this creation is just perfect. It is made of Printed Damier Azur with natural cowhide trimming and cotton canvas lining. The Louis Vuitton Trompe L'oeil Screen Damier Azur Neverfull MM features Trompe L'oeil art direction, meaning that the colors and the patterns are made to look like 3D. It is a popular art direction in France and Louis Vuitton was the first to use it in their creations. Let’s just add that the metal hardware is gold-colored and it looks perfect. Carrying the bag is possible with the two flat handles at the top of the bag. They are comfortable and designed for supreme practicality. You will get a snap closure as well. However, the second main advantage of this bag is the removable zipper-secured pocket with the matching interior and exterior. It looks and it makes the entire creation even more practical. Obviously, inside you get a massive compartment with all the space you are going to need. D-ring is implemented as well. You will want to know that two side laces are added for an aesthetic reason only, but we liked them a lot. 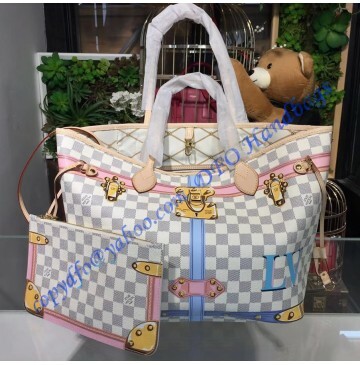 The Louis Vuitton Trompe L'oeil Screen Damier Azur Neverfull is a well-made and great-looking bag which is popular in this year. Still, it is designed for busy women who have an active lifestyle and who are on the go all the time. As such, if you are one of them, then this bag is the right choice. There are a lot of facts to love about it and the look is just one of them. We can add that this particular model is the best-looking creation of 2018.